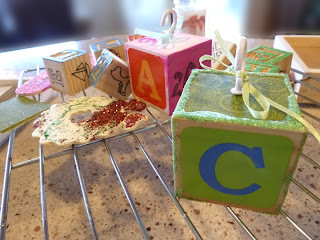 I've already posted a little tutorial on our Alphabet Block Ornaments we did for my Kid's Christmas Craft Party, using their school pictures. 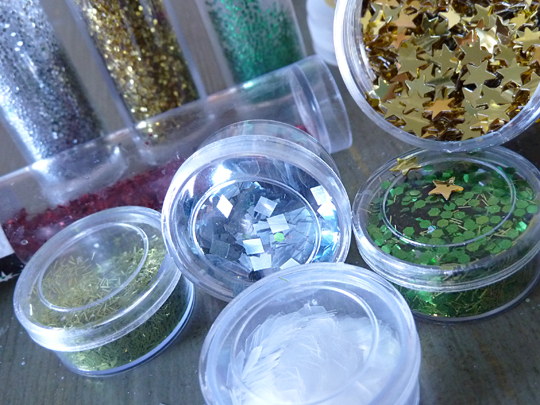 Today we'll look at some of the glitter on them for our mini glitter tutorial. Here are the two kinds of kids' blocks we started with. The classic but smaller natural wood with raised letters and line art; and the newer, bigger Circo colorful ones. The big set from Target is about $15 and is more suitable to the some of size kids' wallet school pics come in these days. But they're glossy and all glues and paints were trickier to stick. The smaller retro style has more charm IMO, tho and is only about $5. At the top of the post I show the number 5 done in a pale green fringy glitter that is super cute. 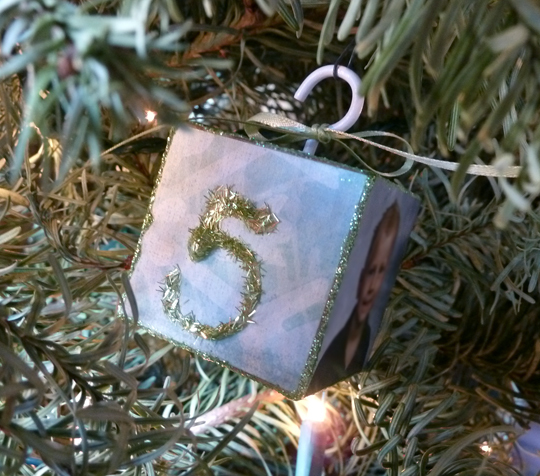 A basic rule is the larger the glitter, the larger the area and the less detail. 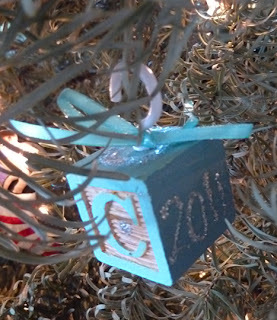 Use a basic white craft glue like Elmer's to write or fill the area to be glittered. Sprinkle and shake off the excess. Paper plates make a great catch to recycle from. 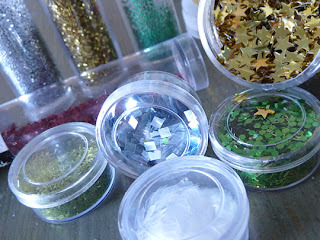 Definitely assist young children when using any of the "pour" or "sprinkle" glitters. 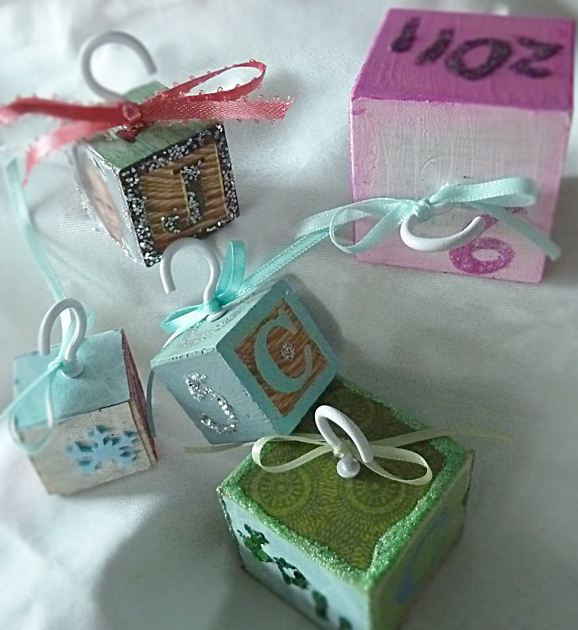 :-) Most sides of that large block were covered in craft paper cut into squares, then decorated with glitter. In addition to sprinkle glitter on the number of the age of the child, we sprinkled the year. The edges or rims were accented using glitter glue pens. The "C" on this classic small block is so much cuter, don't you think? I used my opaque acrylic craft paint to change it's color as well as cover most of the flat sides. The 2011 was done with a silver glitter glue pen. In the above photo you can see the pink 2011 and the green rim on the lower block were done with the glitter glue pens also. It's easy for both adults and kids to glob, but for these projects I think it makes it more endearing. Aim for slow and steady pressure. Have a toothpick and tiny bits of paper towel rolled up to dab and move and basically straighten your work if you desire perfection. I tried to let my kids to as much as they wanted to on the big ones, and my mom and I decorated the little ones after the party. 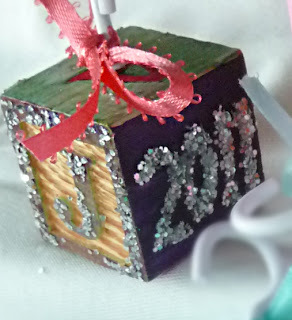 The "2011" on this block was done with tiny silver glitter sprinkled into white craft glue numbers. The "J" also and both were first painted. All glitter projects have to be carefully wrapped and protected while being packed away if, in this case, you're doing Christmas ornaments. Just wanted to say hello and that I found your beautiful blog through the HSHB course...your work is wonderful and so inspirational!